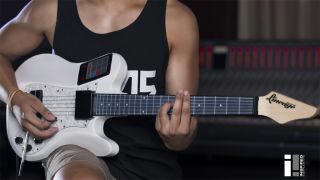 Is this a next-gen six-string controller? While my guitar gently bleeps. Let's be honest: for some players, the words 'MIDI' and 'guitar' will never be comfortable bedfellows, but if you are open to the idea of using a six-string controller, Inspired Instruments thinks it has a real contender in the shape of the Lineage MIDI guitar. Promising super-low latency (around 2-5ms), this features a 3.5-inch LCD touchscreen on its full-size body. Made out of wood, it includes a 2.5mm pearlized pickguard. The maple neck, meanwhile, is 1-11/16" measured at the nut, and sports a traditional 'C'-style contour with a 13" radius. The black and white standard scale 22-fret RADIUS fingerboard has simulated strings, and the instrument uses enhanced YRG trigger system technology for the six stainless steel strings on the body, which have adjustable tension. Control options include a full range whammy with an assignable whammy thumb button, volume knobs and assignable continuous controllers. The screen, meanwhile, offers additional assignable faders, pads, and an XY controller. The Lineage Guitar can be set up to suit the way you want to play - from strumming or finger picking to tap and MIDI monophonic modes - and there's support for open tunings. The whammy-bar range, slide range, and MIDI velocity settings are all adjustable. I/O includes a USB type B interface, MIDI 5-pin connector, a 1/4-inch mono guitar out jack, and a stereo mini headphone/line output. The Lineage has a rechargeable 4000 mAh lithium polymer battery that's said to provide you with 10 hours of continuous playing time. You can find out more and pre-order now on the Lineage MIDI guitar website. The retail price is $999, and the device is compatible with Mac, Windows, Linux and iOS.